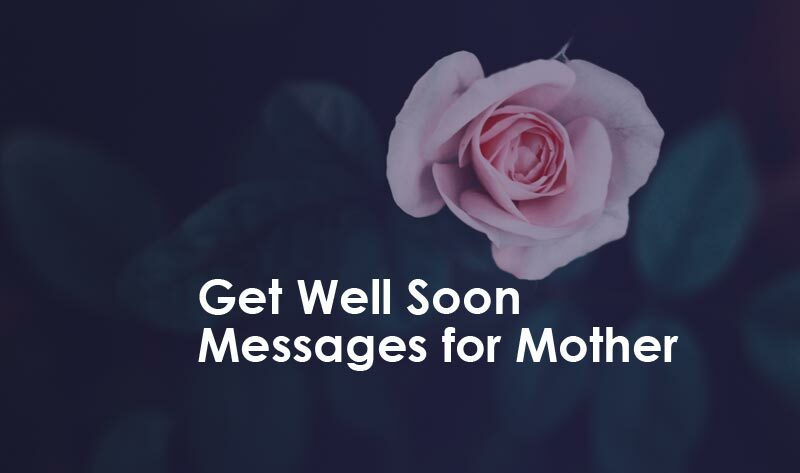 Get Well Soon Messages for Mother : Mothers are the reasons why we are on this beautiful earth. Their loving care and sweet sacrifices make our life, childhood and lifelong memories. But sometimes time can be so cruel that the person we love most gets older or maybe even fall sick. During these difficult times, our mothers need the same caring that she gave us. Sometimes it can be hard for us to stay right beside her when she needs us most. But even if we fail to do so, we can show our emotions, feelings, and love for her through getting well soon wishes messages. A simple get well soon message can make her feel the warmth of our heart. We can all make up some get well messages for mother by our own, but the difference lies in what words we choose. 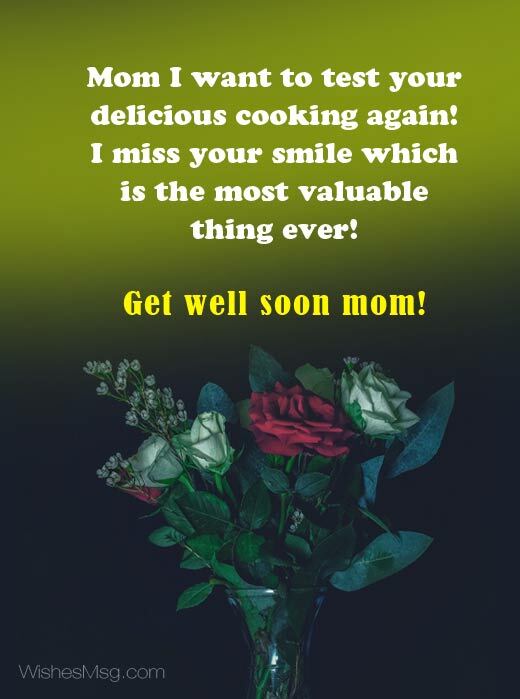 These Get well soon messages for mother can work as magic in such situations. 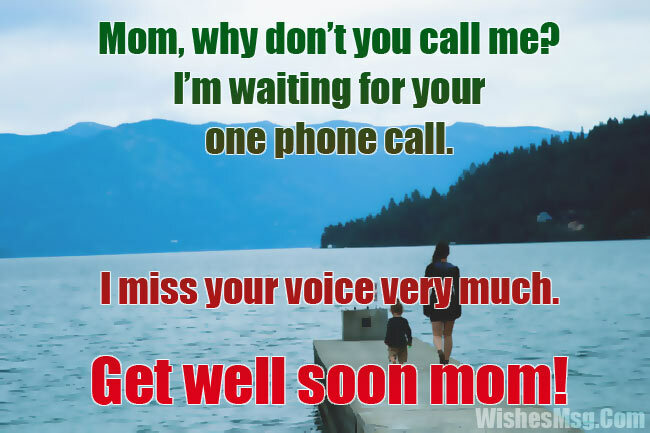 Dear Mom, today I’ve realized that I miss your voice so much. Every morning you used to tell us what to do or what not to do for all the day. But why you don’t talk to me today? It’s hard for me to see you lying on the hospital bed! Get well very soon mom! Mom, without you we are incomplete. Our home is like a dessert! We miss the way you took care of us! We miss your delicious cooking! Please get well soon and come back at home! We love you a lot, mom! How are you, Mom? You know, every single moment I miss you! When I came to know about your illness I start praying for your fast and easy recovery. Get well soon mom! Mom, I’m sorry! I couldn’t come to see you. But believe me, you are always in my heart! I love you, mom! I miss your voice. Please get well soon! Seeing you lying in the hospital bed is the saddest moment ever in my life. I can’t stay home without you mom! I always pray for your fast recovery! Get well soon! Your absence makes everyone sad! Get better soon because we need you, Mom! We love you! Dear mommy, when I wake up in the morning and don’t find you beside me, that is the saddest moment of my day! I can’t wait! Please get well soon for me! Mom, I know you are not feeling well right now! Don’t worry, please. I’ll pray for you all day and night. May Allah recover you fast! Get well soon mom! Mom, Do you know every day when I go to sleep, I miss you so! Without you, there is no one who tells me its midnight, now time to sleep. I miss you every morning because no one tells me it’s too late. Every moment I miss your presence! Get well soon mom! Do you know mom? I feel very lonely without you! I miss the moments when we used to watch movies together, you used to tell funny stories, and we were eating together and everything But now you are a bit sick. Get well soon mom! I miss you! Dear mom, I wish I had some sort of magic. By which I can make all your pain and sufferings that you have right now just go away! But since I can’t give you a tight hug right now, I can only pray to god that he makes you feel better! Love you, mom! Get well soon! Mom, when I look at my phone I miss you! You don’t call me. Then I remember how you can possibly call me while lying on the hospital bed mom! I continuously pray for you! I pray for your fast recovery. Get well soon mom! Mom, I can’t look at your bed! Without you, it looks like scrambling! Get well soon Mom! Mom, I know you don’t feel well right now. But always keep in mind that we all are with you. Be strong mom! I wish you get well soon! Mom, you are my world. Without you everything getting bored. I wish you’ll come back home soon. Get well soon mom! Hospital isn’t the right place you. Why are you even there? I don’t even know how to eat without you or sleep without you. I can’t do anything without you mom! Please get well soon! Mom, why don’t you call me? I’m waiting for your one phone call. I miss your voice very much. Get well soon mom! I know you are thinking of us while closing your eyes? Do you think about me? I’m thinking about you all day long. When you come back home? I’m waiting for you. Get well soon! I know you are getting bored in the hospital bed mom? But don’t worry! We all are beside you. We wish you’ll get well soon! Even the hospitals need some sunshine. So they want to keep you here a little longer. But I told them that it’s not possible. So, you are going home soon dear. By the way, I wish you an even faster recovery. Get well soon mom! How much I love you now I realize that in every single moment mom! I miss your presence in every corner of our house. Get well soon and come back home! Mom we are sending you a lot of wishes and a lot of positive energy for your fast recovery. Get well soon mom! How are you mom? How are you feeling right now? I can’t stay beside you at this moment. I feel very sorry for that mom! Please don’t be worried, mom! Wish you a fast recovery! Please take care of yourself mom. I’ll see you soon at home. Get well soon! Mom I want to test your delicious cooking again! I miss your smile which is the most valuable thing ever! Get well soon mom! We should not have any shyness while expressing our love for the dearest ones. When it comes to our mother, we should express our love with our hearts out. If your mother is on Facebook, Instagram, Twiter or any other social media than you may wish her fast recovery through them. 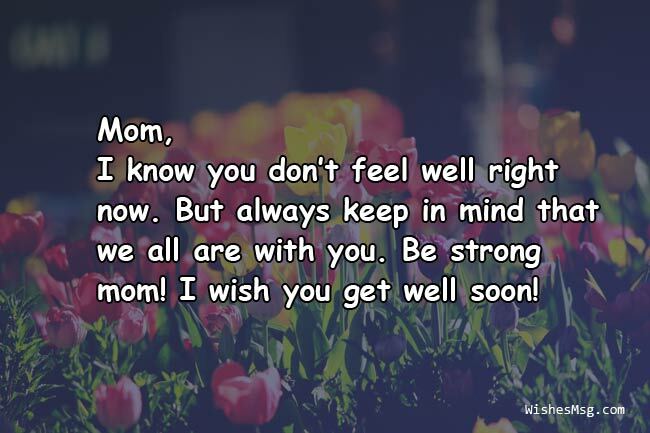 But it will be too good to send a get well card for mother writing a touchy get well note or message on it. And of course, don’t forget to send some flowers also!